Cauliflower steaks, and roasted whole cauliflower posts have been popping up all over the place recently. I’ve wanted to try it out for a while, but Steve has never been a big cauliflower fan (though he loves my cauliflower soup). However he saw a Jamie Oliver recipe for roasted whole cauliflower online, and thought it looked interesting, so I decided to give it a shot. He’d made a mushroom, pea and potato curry, so I decided to do some simple Indian style cauliflower steaks to go with it. And when I say simple, I mean simple. 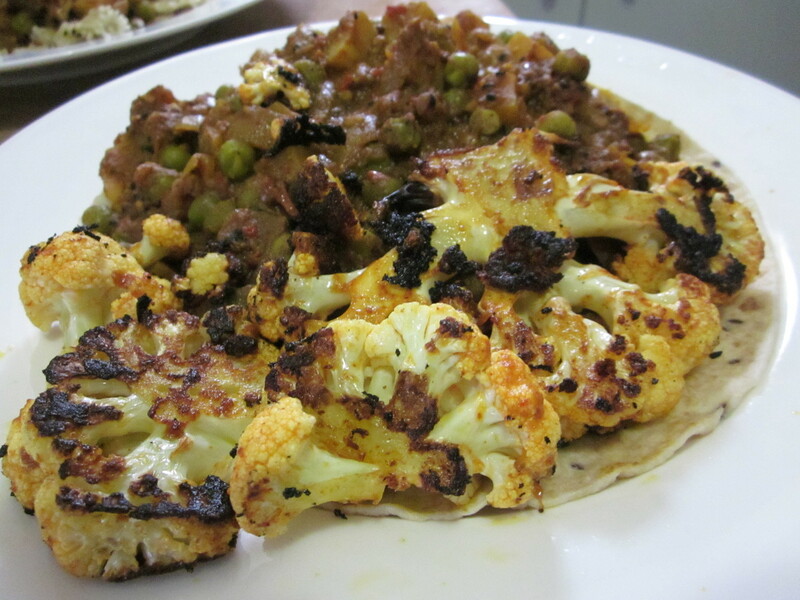 I cut the cauliflower into wedges, and then made the ‘marinade’. We had some korma paste in the fridge, so I mixed the korma paste with some coconut yoghurt, coated the cauliflower with it and then put in the fridge for several hours. When the time was right, I heated some coconut oil in a fry pan, took the cauliflower out of the fridge and cooked in on a medium heat, turning only once, so each side got quite crispy. It was then served with the curry and rice.